Heading mostly west down Del Monte Boulevard in Pacific Grove, as you pass the intersection where the street passes Coral Street, the first house on the right will have an usual sculpture clearly visible. 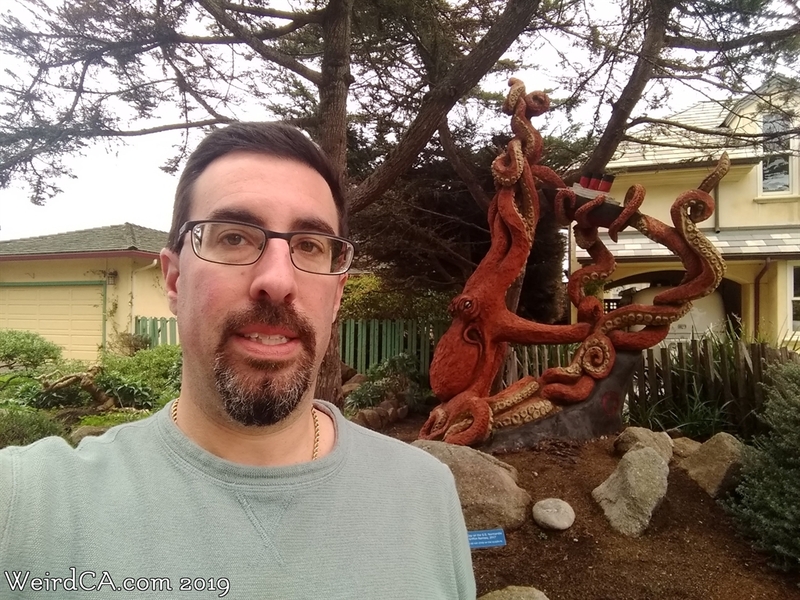 Called "Bad Day on the SS Normandie", a large, dead tree has been carved into a giant octopus attacking an ocean liner! After the tree died, the owners of the property, Matthew and Jessica Denecour commissioned the artist, Griffon Ramsey, to create the sculpture using her chainsaw. The carving depicts a massive octopus attacking and squeezing an ocean liner, apparently the SS Normandie. Supposedly, the largest sculpture Ramsey ever actually carved, it was finished in September 2017. The SS Normandie was an actual ship built and originating from France before World War II in 1935. She is the most powerful steam turbo-electric propelled passenger ship ever built, often competed with the RMS Queen Mary for world records, and often had possession of the fastest transatlantic crossing during her career. Luckily for the SS Normandie, she was never attacked by a giant octopus. She was sadly seized by the US, renamed the USS Lafayette, converted to a troopship, caught on fire, capsized, and finally sunk into the Hudson River. She was eventually scrapped in October 1946. The sculpture is located across the street from a golf course in the front yard of a residential house. The plaque in front states "Bad Day on the S.S. Normandie \ Griffon Ramsey, 2017".